This Curry Roasted Shrimp recipe can be an easy dinner or a delicious appetizer. It comes together in a snap, and it’s delicious warm, at room temperature and chilled too. I love adding flavorful curry to dishes, and I created this recipe for a internationally-inspired ecookbook for Love With Food. It’s similar to my popular Oven Roasted Shrimp with Lemon and Garlic recipe and the Easy Roasted Shrimp with Sweet Peppers I created for Whole Foods Market. Can you tell I’m all about shrimp in the oven? Roasting shrimp is so easy I’m doing it once a week. It’s hard to specifically cite a current cultural reference for curry, since the flavors are popular in the cuisines of India, the U.K., Thailand, Japan, Indonesia, Malaysia and many other countries. This recipe calls for a British invention from the 18th century, curry powder. When Britain became involved in the Indian spice trade, a pre-mixed blend of common curry spices was developed for ease of use, rather than mixing the individual spices for each dish as the cooks in India did. 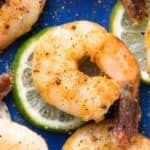 You can use any curry powder blend you wish, but I recommend a Vindaloo-style blend in this curry roasted shrimp recipe for its spicy kick. In a large bowl, toss the shrimp, curry powder blend, coconut sugar and lime slices with 2 tablespoons of the oil and the salt & pepper. 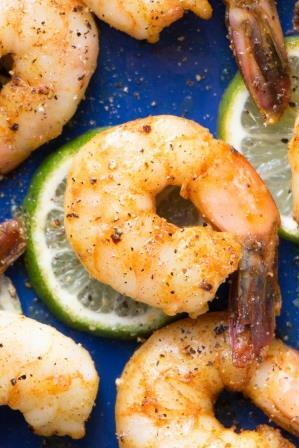 Arrange the shrimp in 1 layer on a rimmed sheet pan, ensuring that the lime slices are spread evenly throughout. Roast for 8 to 10 minutes, just until pink and firm and cooked through. *Can’t find coconut sugar? Use unrefined brown sugar instead. This entry was posted in Appetizers & Snacks, Dairy Free, Main Dishes, Paleo Friendly, Recipes and tagged autism diet, celiac, dairy free, dinner, food allergies, g-free diet, G-Free Foodie, gluten free cooking, paleo, paleo friendly. Bookmark the permalink.